Originally known as the Canada Cup, this tournament was created by the NHL, NHLPA, and Hockey Canada in 1976 and gave NHL players a chance to represent their respective countries. The first five Canada Cup tournaments (1976, 1981, 1984, 1987, and 1991) saw Team Canada and the United States face off against the four best European national teams based on the results of the most recent World and European Championships. The name and format of the tournament was changed to the World Cup of Hockey in 1996, with the world's eight best national teams (Canada, the USA, Russia, Sweden, Finland, Germany, Slovakia, and the Czech Republic) meeting in August-September of that year. The teams were divided into two groups of four, one playing its preliminary round-robin series in Europe and the other in North America. The top three teams from each group advanced to the playoffs, which were all played in North America. The first-place team in each group received a bye through the first playoff round, while the teams that finished second met the teams that finished third in the other group. Winners of the one-game series advanced to the semifinals with the first-place teams. Semifinal winners then met in a best-of-three final. 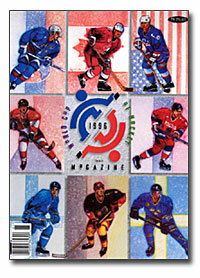 The 1996 tournament saw the United States pitted against Canada in the finals. The series opened up in Philadelphia and Canada downed the U.S. 4-3 in an overtime thriller. Team USA won the second game 5-2, adding two empty-net goals late in the game to force a decisive third game. Team Canada will forever remember Game 3 of the World Cup as "the title that got away." American hockey fans will forever remember Amonte, who scored the game-winning goal with 2:35 left in regulation. Amonte's tourney-winner came only 43 seconds after the U.S. tied the score off Hull's seventh goal of the competition. The Americans added two more goals to their total (one an empty-netter) and skated to their first world hockey title since the 1980 Winter Olympics in Lake Placid. 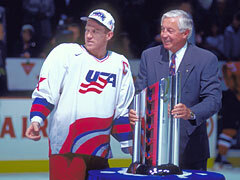 For his stellar efforts Mike Richter was named the MVP of the inaugural World Cup tournament. He made 35 saves, including 23 in the second period, in the series-clincher against Canada.